Simply put, specialty coatings designed for porcelain, fiberglass and other surfaces are applied to your fixtures and tiles to give you a new looking and long lasting surface. With proper care your new finish should last 10 to 15 years or longer. 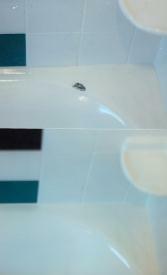 A standard tub in good condition will take about 4 hours, an entire bathroom normally can be done in one day. At 70 degrees, you can expect to use it the next morning as a shower. Does it have to be the same color? No, the same or any color of the rainbow can be used. You can even match your color to a manufacturer's color if desired. Do I have to leave my house when it's being done? No, a modern ventilation system removes fumes and dust during the process allowing you to remain in the house. Yes, the bottom is slippery again. A specialty bathmat is supplied with every tub or non- slip surface can be applied at no extra cost. Do I have to clean it with something special? Nothing special is needed; however, only liquid cleaners and a sponge should be used. Printed instructions will be supplied. Absolutely, I'll provide you with a copy of Certificate of Insurance upon request. Should I do anything before you arrive? Yes, please make sure no dripping is occurring, the drain flows and items easily removed are taken out or put away. Call Today For Your Free Estimate. Fully Insured.